Lanetta Dickens is majoring in English and minoring in African American Studies. She served as an intern in Special Collections during Spring 2012, working on preservation of the DJ Screw Sound Recordings and assisting with the exhibition DJ Screw and the Rise of Houston Hip Hop. Awready! 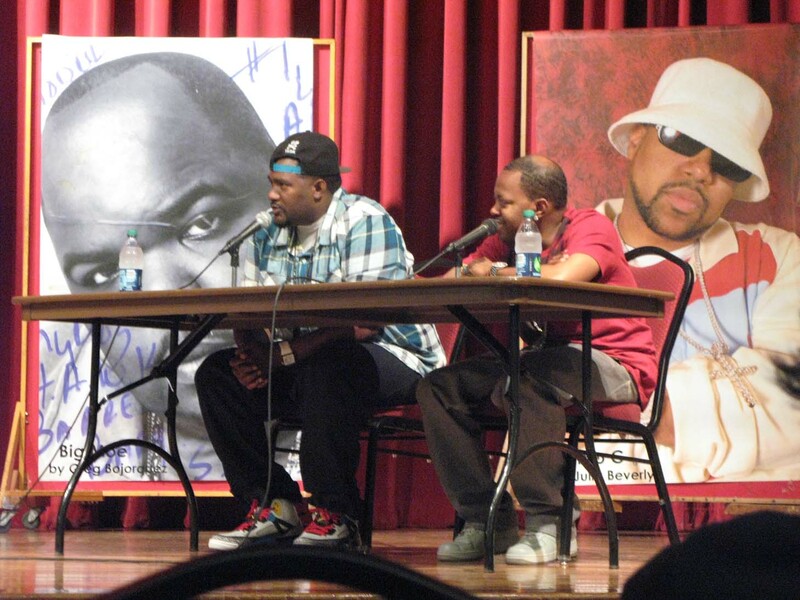 The Houston Hip Hop Conference, presented by the University of Houston Libraries, the HERE Project at Rice University, African American Studies at UH, and the Cynthia Woods Mitchell Center for the Arts at UH, was a recent set of events honoring DJ Screw. I attended the Grafitti, B-Boy and B-Girl Exhibition opening, and the panels/presentations of A Screwed Up History. The art show showcased local Houston artists and their artwork in original display. The event was a success, with free food and fun entertainment. The panelists involved in the conference were knowledgeably aware of DJ Screw and the Screwed Up Click (S.U.C.). Participants on the panels included rappers, artists, writers and scholars who informed the audience about the history and culture of Hip Hop in Houston. One of the scholars, Dr. Ronald J. Peters, Associate Professor of Public Health at the University of Texas Health Science Center, managed a discussion on the effects of syrup with rapper ESG and DJ Lil’ Randy of the S.U.C. The topic was first introduced with a definition of the drug, how rappers and individuals were using it, and the results of using the drug. “Syrup” is a recreational drink based on prescription cough syrup made with codeine promethazine. Both S.U.C. members considered syrup an addictive drug, the use of which was a secretive act initially. However, due to the spread and popularity of syrup, consequences soon emerged, and law enforcement began investigating the drug. Lil’ Randy and ESG expressed their feelings and reactions, saying that they were somewhat surprised by the spread of its popularity. This type of information about the evolving culture of hip hop is important for understanding the African American community and the individuals who have shaped that community. The Hip Hop conference was an experience that I will remember for a lifetime. I was enlightened by the conversations and discussions that were associated with the growing music empire. As a minor in African American Studies, I have learned to appreciate and acknowledge the Hip Hop culture that has extended throughout the world. Hip Hop has made a contribution to our society as a means of expressing and documenting the truth about ourselves. The finding aid for the Carolyn Farb Papers is now back online after briefly being made unavailable while the collection was being reorganized. The bulk of the Carolyn Farb Papers primarily contains papers, photographs, and newspaper clippings, the majority pertaining to her fundraising activities. The material has been arranged into twelve series: Fundraising Events, Honors and Awards, Organization Affiliations, Creative Works, Speeches, Personal Life, Correspondence, Scrapbooks and Yearbooks, Memorabilia, Printed Material, Photographic Material, and Video and Audio Recordings. Carolyn Farb is an internationally known fundraiser, author, businesswoman, and philanthropist. During the past thirty years, she has raised over $25 million for a number of charities and worthy causes, the majority of which are based in Houston and benefit local organizations. Her work and tireless devotion to others have earned her the nickname “the first lady of philanthropy,” and she has received numerous accolades for her efforts. Farb’s interest in helping others began early in her life; as a teenager, she volunteered at the snack bar at Texas Children’s Hospital. Her beloved grandfather, Jake Freedman, a businessman in Las Vegas, fostered her spirit of giving. A native Houstonian, Farb attended the University of Oklahoma, where she studied journalism. In 2003, in fulfilling a life-long dream she received an Honorary Doctorate of Humanities from Northwood University. 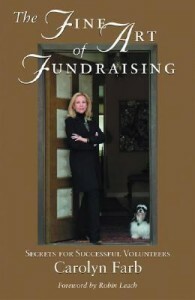 She has written two books on fundraising: How to Raise Millions: Having a Ball, Helping Others in 1993, and The Fine Art of Fundraising: Carolyn Farb’s Secrets for Successful Volunteers in 2004. She was the mother of one son, Jake Kenyon Shulman, who passed away in 2004. An avid art collector, she loans many of her pieces to museums around the world. More information about the Carolyn Farb Papers may be found in the finding aid. To learn more about Carolyn Farb, visit her web site. The finding aid for the Houston-area section of the Society of Women Engineers is now available online. Material in this collection includes correspondence, business and financial records, photographs, and publications of the Houston-area chapter of the organization, dating from 1992-2005. It also contains some materials from the regional and national levels of the Society. The Society of Women Engineers was founded on May 27, 1920 in New Jersey as a non-profit educational resource and support to help promote science, technology, engineering and mathematics for women. The Houston Area section was chartered on July 1, 1979. 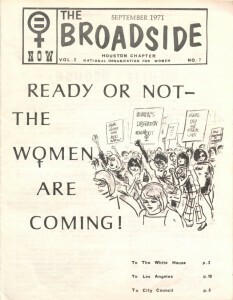 The Houston and Texas Feminist and Lesbian Newsletters collection contains issues of newsletters and similar periodicals from more than a dozen feminist and lesbian organizations and community groups from Houston, Austin, and other areas of Texas. These publications highlight the political, social, and cultural interests of the various organizations and groups, primarily during the 1970s and 1980s. These groups were concerned with such topics as women’s equality, gay and lesbian rights, and sexual and domestic violence. 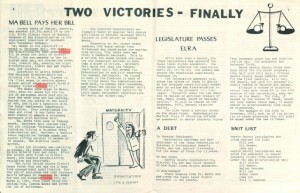 Among the specific topics addressed in these publications are the Equal Rights Amendment, Title IX, and a number of local and national elections. Relevant issues and events, such as appearances by popular and sometimes controversial activists and celebrities, equal rights negotiations with businesses, offensive fraternity hijinks, and the portrayal of women in popular culture, are also documented. Some periodicals provide information about networking and social opportunities. 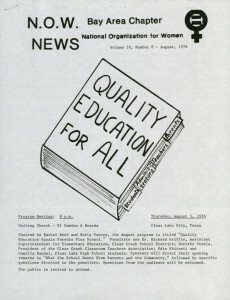 The newsletters are part of the Carey C. Shuart Women’s Archive and Research Collection, which contains the records of women’s organizations and the papers of prominent Texas women. These materials document the range of women’s concerns, the ways in which women have come together to achieve their goals, and the impact they have had on the world around them. This Saturday will be the last Saturday the Reading Room is open until the fall. Starting next week we will be on our summer hours, and the Reading Room will be open Monday – Friday from 9 am to 5 pm. To check the Reading Room hours, including holiday closures, you can always visit our hours page.